The early Gordon Van Tine catalogs are rare. Anything prior to 1915 is difficult to find. I have a few catalogs from the early years, 1907, 1909-1910 and 1913. Lately, I’ve been sharing some of the early models. We looked at the Gordon Van Tine 122 in my last blog. This blog we will look at the Gordon Van Tine 118. This model is unique and I think it will be easy to identify if you come upon one. You’re going to remember this one! Hip roofs are common enough, but in this house an effect is gained quite out of the ordinary by making a low pitch, with wide sweeping cornices. the lines of the building are broad and low the, small ell in front standing out almost like a tower. The pedestaled porch and divided top windows carry out the unusual effects. 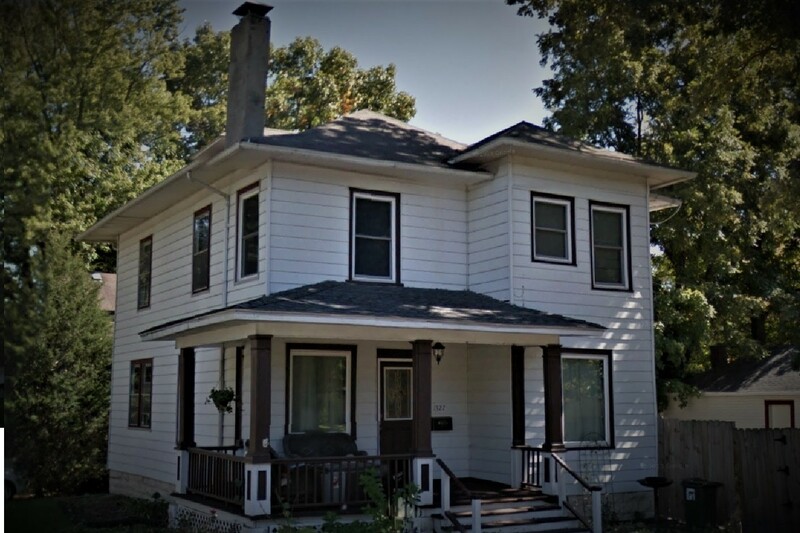 In the early years prior to the ready cut homes a buyer would purchase the plans with the promise of purchasing the materials from the Gordon Van Tine Company. A rebate to offset the cost of materials was given making the plans free. 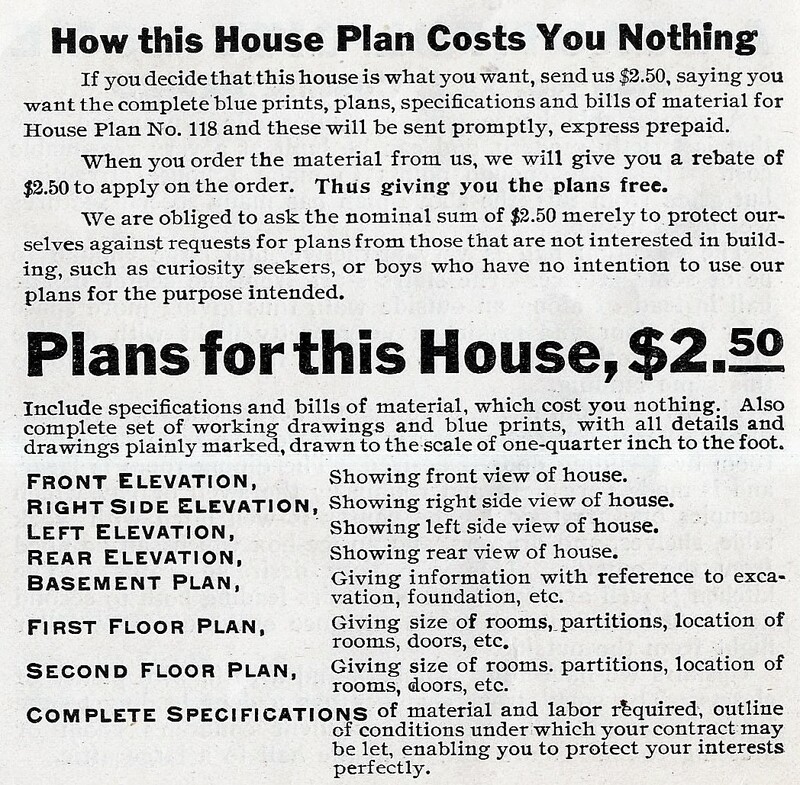 Plans for this house were $2.50 which equals about $60 today. In 1909 the average wage was .22 cents an hour. That’s almost two months pay for plans. So, to get them free is quite a bargain! Build a house today and see what you pay for plans! This is the 1909-1910 Gordon Van Tine catalog image for the model 118. It was briefly offered, a couple of years. 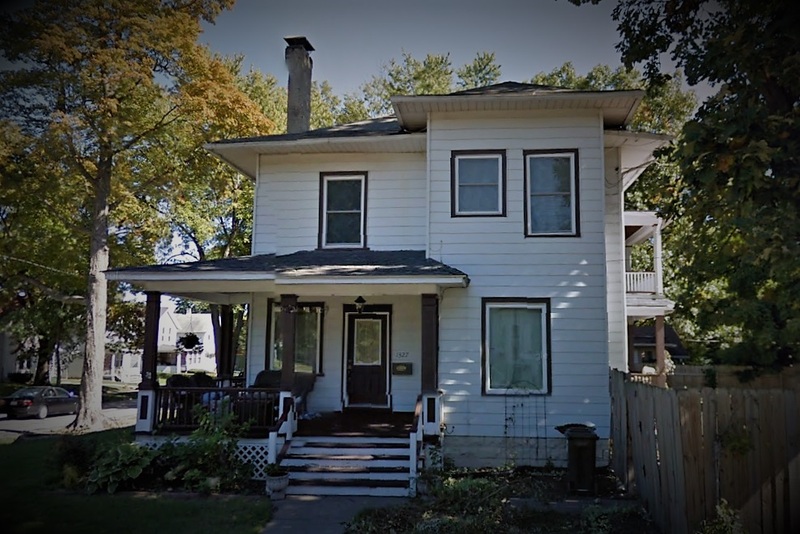 I happened upon this 118 in Davenport, Iowa and it’s the house shown in the catalog. The description suggests olive green with white trim. I think that would be pretty. 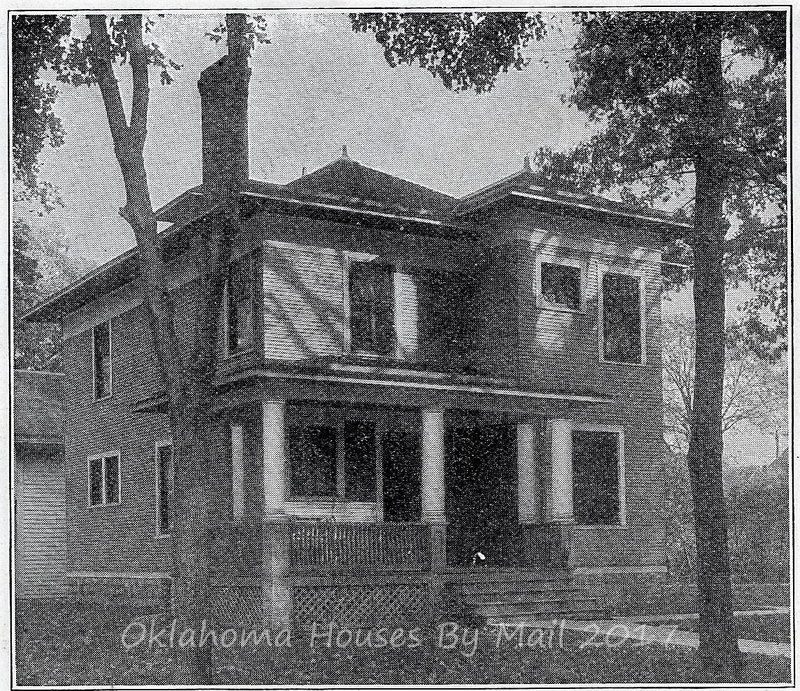 This was the home of AJ (Fred) and Emma Lloyd and their daughter Marie. The Lloyds owned Lloyd’s Clothing Store, which was located at 212 Brady Street in Davenport, Iowa. I wasn’t looking for this house but when I came across it I knew immediately what it was! So unique and different. I see, at first glance, a hip roof foursquare with a ‘tower’ that has a hip roof. And those ‘tower’ windows, three different sizes…almost gives it a face only a mother could love. Have you seen this rare and unique model, the Gordon Van Tine 118? If so, please contact me! There are three ways to contact me. 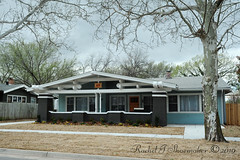 By email: searshomes@yahoo.com You can contact me through Sears Modern Homes on facebook. 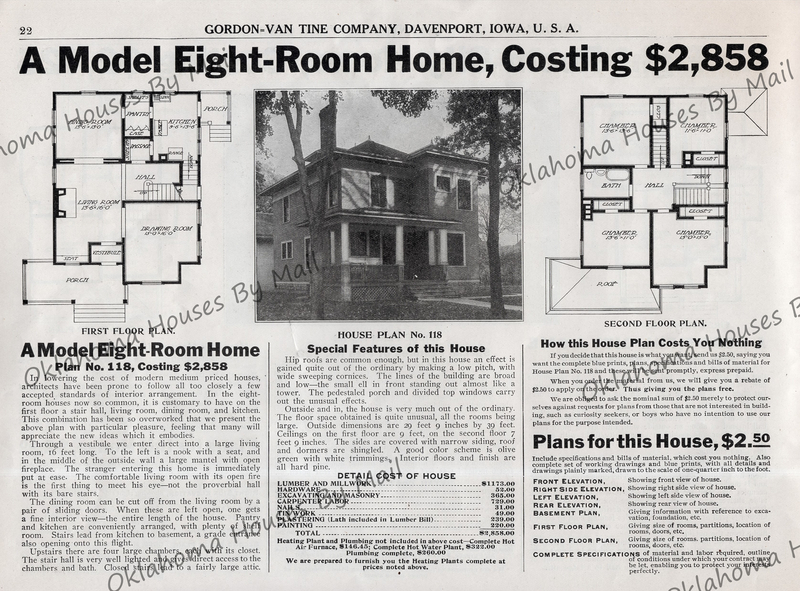 Or, you can leave a reply at the end of this blog..
To see a set of Gordon Van Tine blueprints from a house I identified for some recently click here! Come back for my next blog to see a rare and unique model, the Gordon Van Tine 123, another one of their earliest models. 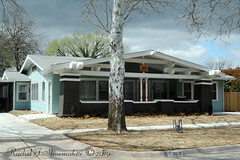 This entry was posted in Gordon Van Tine, Kit Homes of Oklahoma and tagged 1347 Arlington Ave Davenport Iowa, AJ Lloyd, Aladdin Homes, Aladdin Readi-Cut, American Foursquare, Bait and Catch, Bungalow, Bungalow Home, Catalog Home, Catalog House, Craftsman Bungalow, Craftsman Bungalow Plans. Cottage Plans, Craftsman Home, Davenport Preservation Commission, Davenport Scott County Iowa, Edward Roberts, Emma Lloyd, Emmie Lloyd, Follow The Leader, Foursquare Kit Home, Fred Lloyd, Gordon Van Time Inventory of Homes, Gordon Van Tine, Gordon Van Tine 118, Gordon Van Tine Davenport Iowa, Gordon Van Tine Homes, Gordon Van Tine Inventory of Homes, Gordon Van Tine Not Ready Cut, Gordon van Tine Ready Cut, Gordon Van Tine Sears house, Gordon Van Tine Standard Homes, Gordon Van Tyne, Gordon VanTine, gordonvantine.com, Hipped Roof, Hipped Roof with Dormer, Horace G Roberts, Houses By Mail, Marie Lloyd, Montgomery Ward, Prefab Homes, Prefab House, Queen Anne Home, Queen Anne Victorian, Rachel Shoemaker, Roscoe Kline, Rosemary's Bulldog, Sears Archives, Sears Catalog, Sears Elmhurst List, Sears Farm House, Sears Foursquare, Sears Homes, Sears Homes Enthusiasts, Sears House, Sears Kit Homes, Sears Magnolia, Sears Modern Homes, Sears Modern Homes Inventory of Homes, Victorian House, Victorian Plans, Vintage Cottage, Vintage Home Plans, Wardway, Wardway Homes. Bookmark the permalink.